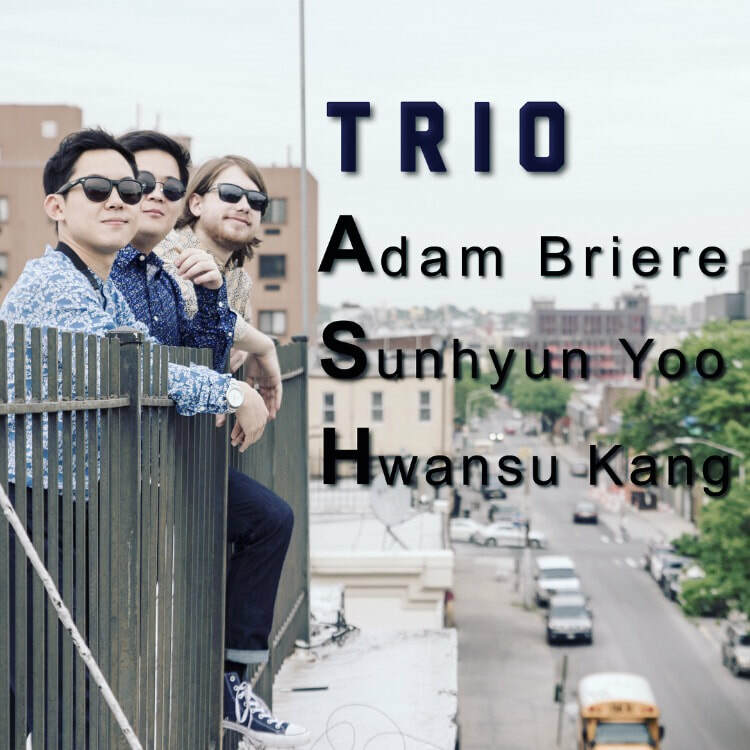 Trio Ash is a chord less Instrumental Jazz trio from New York, consisting of Alto Saxophone, Bass, and Drums. The group’s repertoire consists of original compositions and standards, influenced by traditional Korean Folk music, fused with modern elements of Jazz to create their own innovative sound. The group’s beginnings started at The New School for Jazz, where they studied and played with greats such as Billy Harper, Reggie Workman, Matt Wilson, and Vic Juris. Hwansu Kang is a professional jazz enthusiast, bassist, focusing in performing & composing. He first learned to play electric bass at age of 11, when he encountered many different genres of music, few of which are Jazz, Funk, and Gospel. Hwansu began his early career in Korea with JS Entertainment. Here he experienced his first live performances and recordings. At age 17, Hwansu extended his studies at New School for Jazz and Contemporary Music under provost scholarship in New York City, where he explored music between classical music to avant-garde jazz. Over the years of studying is this institution, Hwansu had a fortune to be taught by many legendary artists, including Reggie Workman, Billy Harper, and George Cables. He is, now, looking to graduate from New School and is continuing his career, performing in and around New York City. Hwansu has already proved his creativity and potential of bass playing with Billy Harper’s quintet on Smoke & Supper Jazz Club and Belleyare Jazz Festival 2016. With this group Hwansu also had opportunities to collaborate with Francesca Tanksley, Aaron Scott, Eddie Henderson, and Freddie Hendrix. Born in Seoul, Korea, and raised in both Korea and United States, Sunhyun Yoo is a professional alto saxophonist, influenced by both Korean and American culture, which gives his music a unique quality. His soulful dark sound springs from his influence on such giants in jazz, John Coltrane, Charlie Parker, Miles Davis, Dexter Gordon, Sonny Rollins, and Kenny Garrett. ​Both his improvisations and compositions strongly show his sensibility in music, arts and life. "Think of Butterfly Effect" is one of his original compositions, which speaks to his conviction and integrity. His composition "Amaranth" was featured on Korean saxophonist Yongmun Lee's 2nd album "Clouds," released in May 2016. His talent in music was first found at age 3, playing the theme songs of Korean drama “Tears of Yeomyung” by hearing it once. Yoo grew up singing in church choral and band. Starting out on classical clarinet during elementary school and middle school years, and finally he switched to alto saxophone in high school years. Beyond his strong passion in music, he began his professional studies in jazz and commercial music at Daegu Arts University in 2007. Studying with saxophonist Dongjin Shin, vibraphonist Jinwoo Baek, guitarist Jungsik Kim led his interest and talent to pursue a currier in jazz music. After couple years of military service in third ROK Army Band, Yoo rapidly started getting attention and recognition in the jazz scene all over the country. His study with Tenor saxophonist Mark Turner in 2013 inspired him to move to New York City to study at the New School. Through serious dedication, he had the honor of sitting in with Randy Weston's African Rhythm Octet in 2016. He has also played with the Billy Harper Quintet as a special guest at The SMOKE Jazz Club and The Falcon Jazz Club. Originally from Reno Nevada, but raised in the San Francisco Bay Area. Drummer Adam Briere started playing the drums at the early age of 5. Influenced by the works of greats such as John Bonham, Elvin Jones, Mitch Mitchell, Stewart Copeland, and Philly Joe Jones. At an early age, Adam quickly became immersed in the San Francisco music scene, playing everything from Pop to Jazz. Adam now lives in NY, where he attends The New School for Jazz and Contemporary Music. And has had the pleasure to study and work with influential musicians such as Adam Nussbaum, Allison Miller, Johannes Weidenmeuller, Henry Cole, Billy Harper, Dave Glasser, David Schnitter, and Vic Juris. Both his improvisations and compositions strongly show his sensibility in music, arts and life. "Think of Butterfly Effect" is one of his original compositions, which speaks to his conviction and integrity. His composition "Amaranth" was featured on Korean saxophonist Yongmun Lee's 2nd album "Clouds," released in May 2016.